That was the sentence that ended my scouting profile of Roberto Aguayo just under a year ago. Aguayo was coming off a slightly-disappointing senior season in which his accuracy dropped to 80.8% on field goals after being north of 90% for his first two seasons at Florida State. In particular, Aguayo had been nearly-flawless as a freshman in Tallahassee, making all 94(!) extra points he attempted, while also going 21-for-22 on field goal attempts. So how did a kicker who made over 95% of his field goals in his first year at one of the biggest programs in college football wind up with the lowest field goal accuracy of any NFL kicker in 2016? And where did I go wrong in my scouting process? Before discussing Aguayo’s specific issues, we need to segue into a brief history of kicking to understand the context behind Aguayo’s motion. The angled, soccer-style approach first utilized by the Gogolak brothers in the NFL during the 1960s fundamentally changed kicking, allowing kickers to create significantly more power and maintain greater control by activating their hips and striking with the upper-inside part of the foot. However, the one downside of the soccer-style approach is that momentum is not naturally flowing through the target as in the straight-on style used previously. Rather, the kicker attacks the ball on a sweeping plane, much like a golfer striking a golf ball (drink once for golf reference). Thus, the major question kickers had to solve with this technique was how to properly calibrate their swing in order to get their momentum moving in the right direction at the point of contact. One of the key developments in this journey was the creation of the skip step. Rather than staying planted in the ground like a quarterback’s plant foot after a throw, a kicker skips through the ball after contact, allowing his momentum to clear in the direction of the target. This helps to maintain power, by allowing him to continue on his course, and also improves accuracy by helping a kicker follow through to the uprights. Kickers with different swing planes employ skip steps of varying size, speed, and direction, but the overall principles remain the same. Aguayo’s dynamic skip step has allowed him to clear his hips too early in his motion, as there is not enough resistance against his leg whipping through the zone. Rather than following through to the target, his weight is carried off the outside of the left upright, and the ball follows the same flight path. A funny thing happened as Aguayo began the 2016 pre-season – he started missing to the right, rather than to the left. It is unusual to see a kicker dramatically change their ball flight in this manner, and the frequency of misses was a concern through training camp as well. After examining the tape, the reason for the issues was clear. 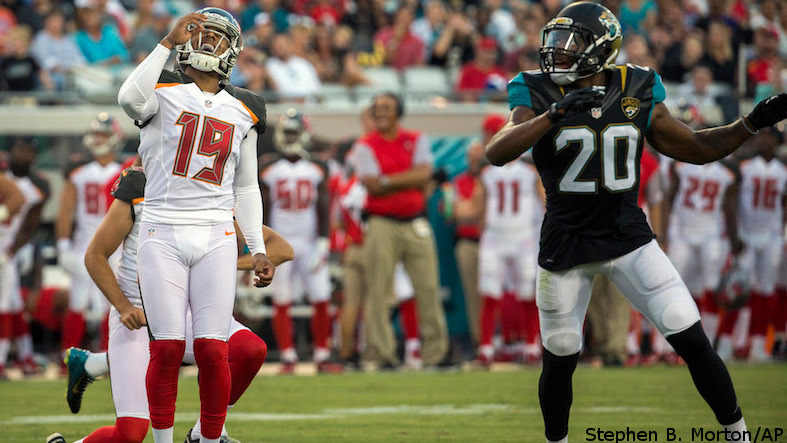 The still above shows two 2016 pre-season kicks against the Jacksonville Jaguars. 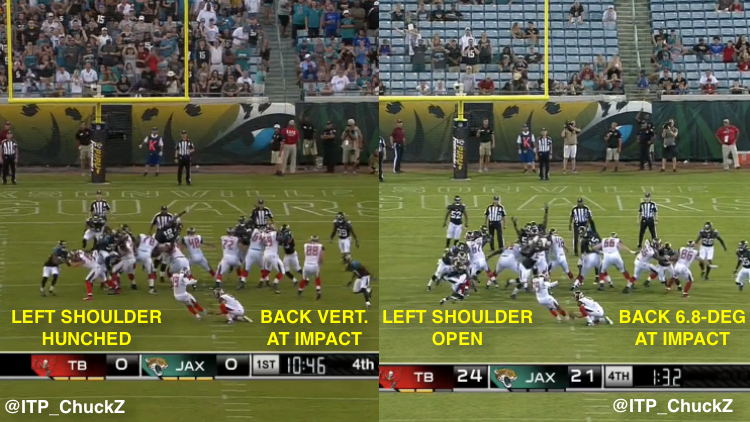 In the left image, Aguayo’s back is vertical, and he is hunched over the ball, preventing his hips from clearing properly. In the image on the right, his back is at a 6.8-degree angle from the ground, with a more open posture that allows his hips to flow through correctly. 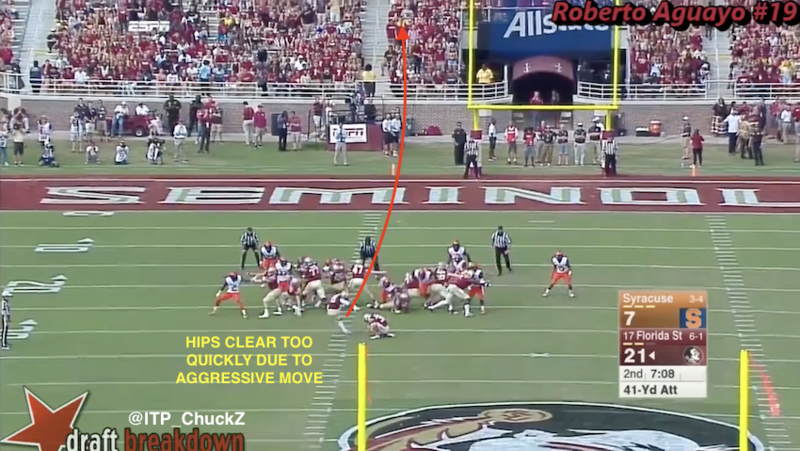 Aguayo missed the first kick wide right, while making the second kick cleanly. Aguayo’s skip step, although it could fire too early on occasion, is the mechanism he built to allow his leg’s momentum to be flowing through the target at the point of impact. Remember that a kicker’s swing operates on a plane, it is not naturally flowing vertically straight through the target. In Aguayo’s case, his natural swing plane is actually pushing the ball off the outside of the right upright – but the counterbalance of his skip step and momentum moving to his left allowed the force to be imparted directly through the target when everything was working smoothly. But the slight hunch Aguayo picked up last pre-season had the effect of shifting the momentum of his skip step because of the added resistance on his front side. As a result, there was a less consistent pull to the left to balance things out, which resulted in a higher number of misses to the right. The timing and execution of Aguayo’s skip step is so critical to his success, and a little wrinkle in his mechanics like this one was all that was needed to throw things out of whack for the season. The question as far as my own scouting process is concerned is twofold. First, what are the key lessons to take away from Aguayo’s development? Second, what processes do I need to put into place to make sure I do not make the same mistakes again? The first takeaway is that I discounted the probability that Aguayo’s skip step would cause issues in the future, despite noting that it had the potential to develop into a problem. When projecting players into the NFL, the critical task is being able to identify the probability of a player attaining a certain level of play. The terms that are tossed around with regards to this are often simplified into “ceiling”, “baseline”, and “floor.” So the two-part question we have to answer when scouting players is where do those three possible outcomes fall, and what is the probability of hitting each one? We can use additional precision if necessary, but with the small statistical sample size we work with on kickers, that tends to produce more questions than answers. In this case, I placed too much emphasis on past performance, as opposed to the potential for Aguayo’s skip step to reduce his accuracy. I assumed that since it had worked to a certain point in his career that it would continue to work in the same way going forward. In doing so, I assigned too high of a probability to him reaching his ceiling, and too low of a probability to his baseline and floor. The issue was not that the flaw was not noticed – it was that rather than trusting what my eyes were telling me, I trusted Aguayo’s statistics to remain as they were before. However, even the statistics showed a slight decline through his college career. As noted earlier, Aguayo’s accuracy declined from 95.5% during his freshman year to 80.8% in his senior season. Unfortunately, this is not a statistically-significant result, as the numbers imply there is a 25% chance this is because of random fluctuations that one would expect from a kicker. So while the numbers suggested that there was a strong probability that Aguayo had indeed declined, it was not a strong enough probability for me to say there had been a definitive change. But that assumes these numbers are created in a vacuum – and this is why I again return to what I saw on tape. The key mistake I made here was seeing a small statistical shift, but not trusting my eyes to connect the dots on why that had happened and what it might mean for the future. This is not to say that I should have predicted that a year like this would happen and that Aguayo should go undrafted – but it is to say that I should have significantly lowered the probability of Aguayo reaching his ceiling early in his career, and as a result, should have had a draft grade two or three rounds lower. The talent was still present, but the likelihood of tapping into all of that potential early-on was lower. So what am I doing to adjust my process? I am not making a drastic shift in how I scout prospects, as I was able to identify the issues that were present. The breakdown was in being able to project properly, and so I have rebuilt my matrix for grading kickers. Rather than viewing statistics and mechanics separately, I have a new sliding scale that adjusts the weightings for each category based on the number of issues present, and then creates a combined grade. With this new process, I hope to be able to more accurately grade based on the issues present, rather than underpricing the risk that is inherent in all prospects.